Begin cooking rice by adding twice as much water as rice to a pan or rice pot. Cook rice while preparing the dish. 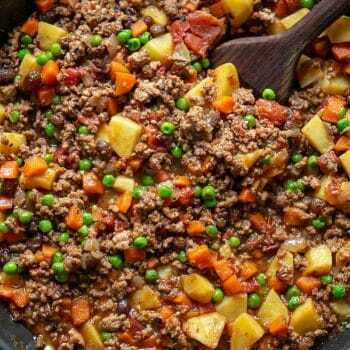 In a large skillet or sauté pan, over medium to medium high heat, place 2 tablespoons of olive oil and once shimmering, add potato and carrots. Fry this for 15 minutes, stirring occasionally. They should start to brown and be just shy of tender. Remove these to a bowl with a slotted spoon but leave oil in pan. Add remaining tablespoon of oil and onion and sauté for three minutes. Add garlic and sauté for one minute. Add the ground beef and ground pork and sauté for about eight minutes or until browned. Make a hole in the center and add tomato paste and stir that for one minute. Add the tomatoes, salt, pepper, raisins, fish sauce, soy sauce, chili garlic paste, water and reserved cooked potato and carrot mixture. Reduce heat to medium and simmer until most of the liquid has evaporated. Add peas, stir and remove from heat. In a fry pan, fry enough sunny side or over easy eggs as needed for each dinner guest. Serve by placing cooked white rice in a serving bowl, top with the Picadillo then top with one fried egg on top of each portion. Serve with Tabasco on the side along with Savory Fried Plantains.